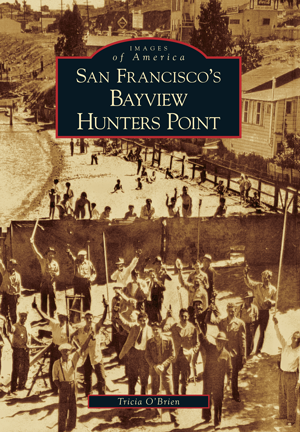 I just wanted to thank you for the Hunter's Point/Bayview book. I gave it to my husband for his birthday. He was in the 1966 graduating class of All Hollows and his sister was in the 1949 kindergarten class. Both of their class pictures were in the book. He spent an hour talking to her on the phone about people & pictures in the book & I just bought another book to send to her. We are 4-year residents of the Bayview and have really enjoyed perusing the photos and captions of San Francisco's Bayview Hunters Point by Tricia O'Brien. I'm writing because I was hoping to pass on to Tricia how much we appreciate her efforts in pulling together this wonderful collection of photos and stories. My husband and I are always drawn to the history of the places we live. What was it like before? What did it used to look like? Who lived in our house before us? What about before them? Perhaps it's a product of our East Coast upbringing, where histories of places seem more entrenched and memorialized. Or perhaps it's just part of the process of getting older, that you begin to see yourself as a part of much larger whole, a much larger story. We live in between two very long-time residents of the neighborhood, and at every opportunity we glean additional bits of neighborhood history from them. Her book has helped to fill-in additional details that we've been curious about. It was so exciting to review the photos and stories that Tricia collected. I just came inside from showing the book to our very sharp 89-year old neighbor. He's lived in his current apartment since the mid-60s and he worked at the Shipyard from 1951-1974 ("I was there on the day it closed" he always says.). Prior to his current home, he lived on Shafter for a number of years, and before that he apparently lived above Mazzei Hardware for a period of time. I showed him some of the old photos of Third Steet. His face lit up as we talked about the Dutch Mill Creamery, where he "used to each lunch for a dollar and a quarter." And he says he saw many a movie at the Bayview Theater for "half a dollar." There were even some early photos that surprised him! In the present day of pop-up neighborhoods and soulless subdivisions, we feel lucky to have this history around us. We are truly stewards in a much longer story. Though often disparaged in the media, this neighborhood has a rich history, and a bright future. It's very exciting to finally have a collection that reveals that history more clearly.